Have you ever wondered what are the things to do in Madagascar? The answer is to search for Madagascar’s lemurs! Ranohira was a one street town. A ramshackle stretch of shacks that looked like many other Madagascan towns we had driven through. Like most tourists who visited Ranohira we were here to visit Isalo National Park, famed for its spectacular sandstone cliffs, etched with deep canyons and oases where crystal waters spilled from the earth. It was also known for its lemurs. 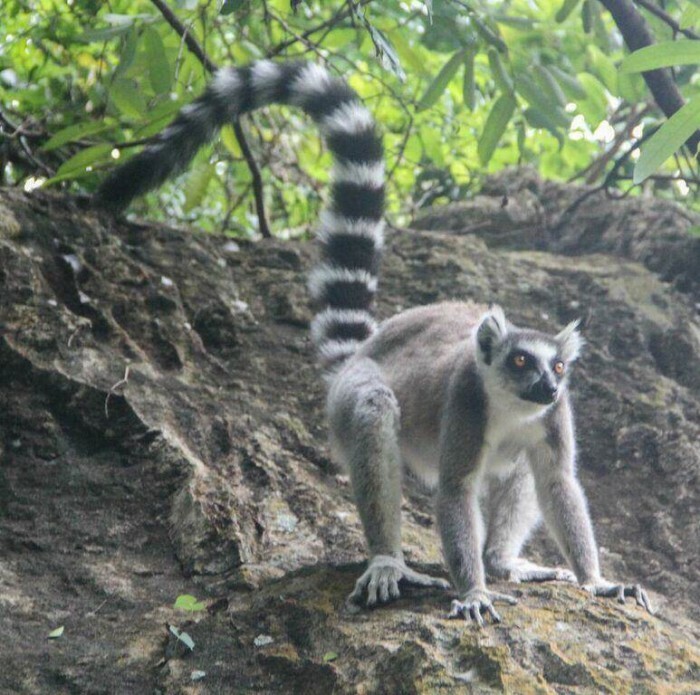 After consulting a few guides and sizing up different itineraries, we settled on a three day/two night trek that would traverse some of the park’s highlights and give us ample time for lemur-spotting along the way. We also hired a cook/porter who sauntered ahead each afternoon to prepare delicious 3-course meals using locally sourced produce. We departed early the first morning and within an hour spotted our first primate, a Red-fronted lemur, nestled asleep in a low-hanging branch. He continued to dose as we madly photographed him from every possible angle. We continued hiking throughout the morning with the spectacular escarpment stretching out in front of us as far as the eye could see. Crossing down to a river bed we rock-hopped across its fast-flowing waters and set up camp in a local village on the other side. Freed from our heavy load, we spent the afternoon exploring the spectacular gorge which cut into the escarpment, a wonderland of cascading falls, swimming holes and impressive boulders. We didn’t see another soul and it felt like discovering our own lost world. That night, far from the light pollution of the city, we fell asleep with the luminous night sky blanketing us above. The following morning we slowly but steadily hiked up a steep track which switchbacked up the escarpment. We stopped often to catch our breaths and take in the views of Madagascar which radiated beneath us. When we arrived at the top it felt like we were on the top of the world. From here we continued through magnificent rock formations and watched as Verreaux Sifaka’s, a white lemur with black belly, scuttled playfully across this rugged and otherwise seemingly desolate terrain. Up ahead a cluster of greenery came into view, revealing itself as a lush oasis as we descended into it. A waterfall cascaded over a small ridge into a pool of crystal clear water at its base, draining into a small stream lined with palms. It was within this paradise that we spent the afternoon swimming and soaking up the sunshine, before falling asleep in satisfied exhaustion. I woke early on the last day to high-pitched calls from above and the racket of playful fighting around me. Unzipping the tent, I looked out to see around twenty ring-tailed lemurs going about their morning antics, oblivious to my presence. These are perhaps Madagascar’s most iconic lemurs, with long black and white-striped tails and charismatic faces. To be so close to these carefree animals was an honour and I stayed photographing them, captivated, until it was time to trek back to Ranohira. There are plenty of options for visiting Isalo, including day hikes, but if you really want to explore the beauty of the park then an overnight or multi-day trip is highly recommended. Tour operators in Ranohira can organise tents and sleeping mattresses, but it is more economical to come with your own. If you are on a tight budget you can self cater, carrying all your own food, snacks and cooking equipment, but a guide is mandatory for entering the park. The park headquarters in Ranohira has an official list of prices for guides, porters and equipment hire to ensure the men receive fair wages and entrance fees to the park are also payable here. A good pair of hiking boots will help you negotiate the rough terrain, while long trousers (men, women) and a warm fleece (men, women) are needed for the cool nights (particularly during the Winter months). The campsites are equipped with toilets but there is little or no electricity so don’t forget to bring a head torch to help you get around at night and a travel towel. Cover up during the day with sunscreen (face and body), a hat and a pair of sunglasses as the midday sun can be fierce, and mosquito repellent is definitely necessary at dusk! For lemur-spotting, carry a set of binoculars to get an up-close look and a 200-300mm camera lens is preferable for capturing detailed shots and facial expressions of these curious critters.